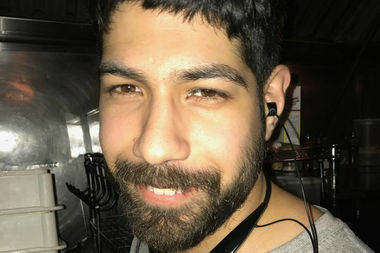 Neftaly Ramirez was biking home from his shift at Paulie Gee's when he was hit, staff said. BROOKLYN — The garbage truck in the fatal hit-and-run with a Greenpoint cyclist Saturday belongs to Action Carting and has New Jersey plates, police said Wednesday. The truck driver was traveling south on Franklin Street when it turned right onto Noble Street at about 12:30 a.m. Saturday, fatally striking Neftaly Ramirez, a 27-year-old bar back at Paulie Gee's, who had just become engaged to be married, police said. It wasn't immediately clear if investigators have figured out who was behind the wheel of the truck. There were no arrests as of Wednesday afternoon. "Action Carting is cooperating fully with the investigation," said Ken Frydman, spokesman for the company, which operates in New York and new Jersey. Ramirez, who lived in the East Village, was recently engaged to be married and had been working behind the bar at the popular pizzeria Paulie Gee's, his boss said. "He was a very gentle and innocent young man," the pizzeria's owner, Paul Giannone, told Gothamist. "That's the best way to describe his demeanor...The most important aspect of his job was the social aspect of it. He loved being with his coworkers."